Our Truffle Treasure Chest Hamper will give your foodie friend, relative or colleague the complete truffle experience! 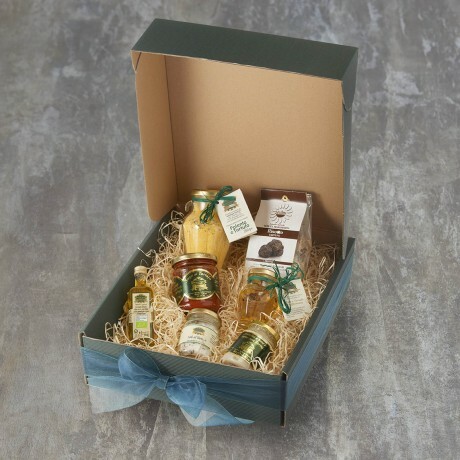 It's the perfect gift for truffle connoisseur and contains seven of our most popular truffle specialities. It is presented in a strong, dark green fluted box that will be handy for storage once your lucky recipient has enjoyed all of the goodies inside! Truffle Risotto (250g) (Serves 2-3 people) Our risotto mixes are prepared in Vercelli, Northern Italy. Only superfine Carnaroli rice is used in our mixes which are made to a traditional family recipe. Easy to prepare with all natural ingredients, this tasty truffle risotto makes for a quick and gourmet main or side dish. Organic Truffle Oil (55ml) This delicate truffle oil is made with extra virgin olive oil and flavoured with white truffles. Wonderful when added to pasta, drizzled on to meat or a pizza, it will give an wonderful truffle kick to your dishes. Truffle Butter (80g) Produced simply with butter and bianchetto truffle from Aqualagna, this is a mouth-watering artisanal speciality. Wonderful spread on bruschetta, stirred into a bowl of pasta, tortellini or gnocchi, in a risotto or as a condiment for grilled fish and meat dishes. Truffle Salt (100g) This wonderful, aromatic truffle salt is made with Cervia sea salt with the addition of highly prized black summer truffle.Our truffle salt will give an earthy truffle kick to many dishes. It is excellent for flavouring meats, especially steaks or grilled meat, for sprinkling on a bowl of pasta or risotto or even over a bruschetta. You can add it to scrambled eggs, omelettes, salads or baked potatoes – basically anywhere that you would use normal salt. A little goes a long way and it lasts for ages. Tomato and Truffle Sauce (180g) A quick, simple and totally delicious sauce to make any type of pasta dish special. A little goes a long way so just add a small amount of it to infuse your dish with the earthy, garlicky flavour and pungent aroma that is associated with truffles. Can also be added to mashed potatoes, risotto or soup for an incredible finishing touch. Made with black summer truffle and tomatoes, extra virgin olive oil, aromatic herbs, salt and natural flavours. Organic egg Campofilone Fettuccine (250g) Our Organic Fettuccine have been hand made in Campofilone in Italy’s Marche region and flavoured with aromatic, black summer truffle. Campofilone Fettuccine are recognized as one of the best Italian pastas thanks to the freshness of the natural raw materials and ancient traditional preparation. They are rolled until exceptionally thin and have an incredible flavour and texture due to slow drying at just above room temperature. Season with light sauces or even better with extra virgin olive oil or butter, and a sprinkling of cheese of your choice. Cooking time 2-3 minutes. Acacia Honey with Truffle (120g) Made with acacia honey and slithers of indulgent black summer truffle slices, this versatile, gourmet honey has an intense aroma and rich, sweet and savoury taste. It is excellent with ricotta and blue cheese, parmesan and pecorino, in salads, drizzled over thinly sliced prosciutto, in a marinade and as a glaze for roasting. We wrap all breakable items carefully and individually inside the box and then tie with a beautiful ribbon. A gift message option is available for you to send a personalised message to your recipient. Please note that if we are out of stock of any item we reserve the right to substitute it with the most similar available item.